“How shameless can a person be ? ?”is the question Congress must answer. On one hand we have Narendra Modi who, in his childhood, left his home so that he could serve his motherland. He never lived the life of a family man thereafter. Salute to the sacrifices made by the couple. On the other hand, we have Congressman Digvijay Singh [age 67] who met his new found love [age 43] even while his wife was struggling with cancer (the texts are dated 2010, his wife died in 2013). And after the intimate photos of them were leaked on internet, Digvijay says he has no problem admitting this relation ?? Well Mr. Digvijay, sir, you had no choice !! 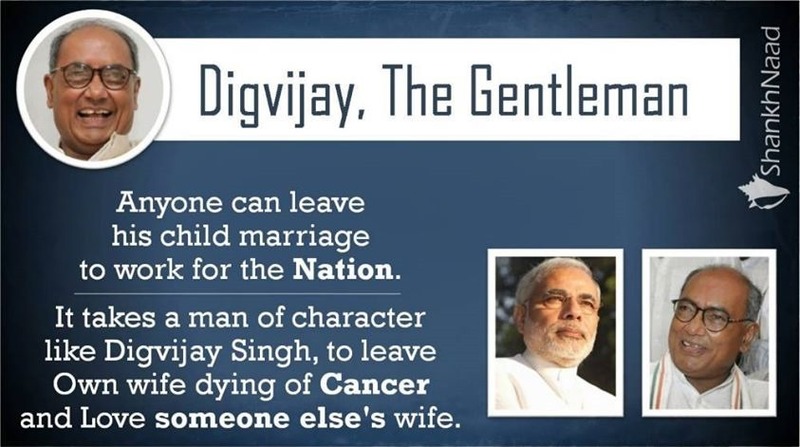 [not to forget, Digvijay’s eldest daughter is also 43 years old] And so we ask, what moral rights do you have to question Narendra Modi’s integrity ? My Comments : Dr. Subramanyaswamy has tweeted this. What has happened to him? When did he start thinking?